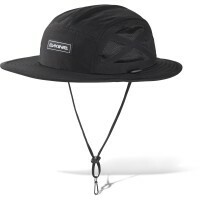 Dakine with Kahu Surf Hat surfers and water sports enthusiasts done a huge favor. Specifically for use in water suitable, it floats and does not sink. The chin strap is not only adjustable but can be removed. So the hat sitting on the one hand while surfing firmly on the head, but is also suitable for the beach or hiking, where the chin strap is not needed. In order for the welding of Dakine Surfhut has not runs in the eye an inner lining that absorbs perspiration and dries quickly. Customer evaluation for "Dakine Kahu Surf Hat Hut Static"